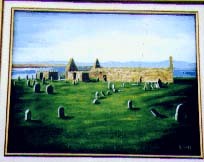 This is a painting of the Clan MacLeod Chiefs Cemetery,  Isle of Lewis, just outside of Stornoway, Scotland from a photo I took while on a trip to the area. 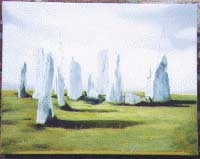 This is a painting  of the Callandish Stones on the Isle of Lewis, Scotland from a photo I took while on a trip to the area. This is a silhouette of Garry and Lynn after the big storm storm in , B.C. 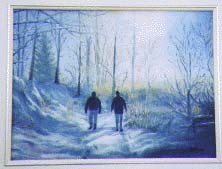 between Christmas 1996 and New Years, walking down their lane to the lower field. 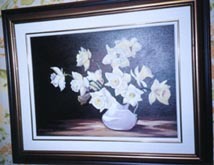 This is a copy of a photo/painting of a cottage & Trees, open field. 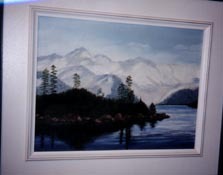 This painting, Dec. 96 is of Battleship Island in Garabaldi Park. B. C.